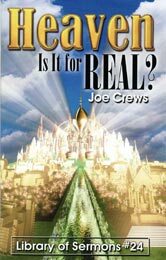 Heaven: Is It for Real? | Is Heaven For Real? without spot or blemish. Now it is true that the devil came into the picture and interrupted God’s plan, but he did not change that plan. God will finally carry out His great original purpose as it was revealed in the Garden of Eden. He will restore this earth to its first dominion. He will make it sinless and perfect again, and His people will live here in the beauty of Eden restored. The wicked today have more of the earth than the righteous, and I suppose the finance companies have more than both groups together. But some day, God says, the saints will inherit the earth. descends to this earth at the end of the thousand years, the earth will be re-created in its original, perfect form. God’s dwelling place will be among men, and the saints will dwell in both the city and the new earth. We will have a city home as well as a country estate. The mansion in the New Jerusalem is being prepared right now by Jesus (John 14:1-3). We will build our own house in the country to our own specifications (Isaiah 65:21, 22). choir. You can go into the bass section one day and learn to sing bass, and then you can go into the tenor section and sing tenor. You can sing all the parts and learn just as much about music as you want to learn.